VENDU EN LOT OU AU DETAIL. GOLD ProMax Banger BMX Stem 53mm - 1 - 1/8" Steerer Tubes - New in Box. 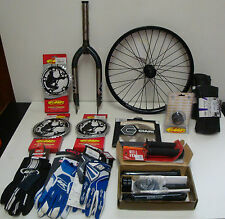 What Is Included in this 16 Piece BMX Parts Lot Kit. PURPLE Shadow Conspiracy Purple Hollow Bolt Set - 25mm length - 6mm Hex Head - Heat treated. PURPLE KMC Chain 1/2" x 1/8" Z410. PURPLE Acorn Bolts 3/8" - 26T. What Is Included in this BMX Parts Lot Kit. Bullets, grenades and 8 balls are aluminum and the rest are plastic or plastic with steel inserts. Replaces SRAM "New" 2013 10-speed Red, Red 22, Force 22 and Rival 22 (non-hydraulic) hood covers. LOT of 4 Sets of SRAM 22 Brake Hood Covers. Good Luck and CRANK ON! 4 Pairs of Hood Covers. Color: Black. Job lot of new bicycle parts. Puncture repair kit with levers. 7x barrel end brake cable inners. 3 rim tapes. 24x 1.75 inner tube. Pair of shimano Msystem brake cables. 700 x 38/43 inner tube. 8x inner gear cables. From Nova Double casing guide x 1. My loss is your gain. Just want it out of my way. 6.1mm (large brake cable) stop x 6. AL seat collars, 29.8mm x 4. Single hydraulic line guides x 38. Blind water bottle bosses x 25. ORANGE KMC Chain 1/2" x 1/8" Z410. What Is Included in this BMX Parts Lot Kit. Bells, rear skewer, reflector parts, key clip thing. new, bells all have scratches and one is missing screw. assorted parts as shown. Specification: Description: Great replacement for the broken or missing steel balls on the bearing wheel. Ideal accessory parts for bicycle repairing use. Made of steel mateiral and with 60 pieces in the package. .
Bike parts lots specialized saddle profile design bar crank brake Shimano lever. Condition is Used. Shimano brake lever, Shimano shift cables packs, brake cable packs, uno bike stem, bar tapes, tubes are new. Profile bar, specialized saddle, cran ceek bar end levers, and sugino chainring were used only one time before taken off due to fitting issue. Replaces SRAM "New" 2013 10-speed Red, Red 22, Force 22 and Rival 22 (non-hydraulic) hood covers. LOT of 3 Sets of SRAM 22 Brake Hood Covers. Good Luck and CRANK ON! 3 Pairs of Hood Covers. Color: Black. Job Lot de quatre (4) vintage Chrome Fork couronnes dont un "Triomphe"
7075 ALLOY - VERY LIGHT. NEW AND UNUSED. THE STUDS ARE THE NON THREADED TYPE AS USED ON OLDER CANTI OR V TYPE BRAKES. THE USUAL RRP OF A SET IS £8.99 (for 4 blocks). SORRY ONLY EXCEPTION IS COMPLETE BIKES AS WE CANNOT SEND MORE THAN ONE IN A SINGLE PARCEL. Replaces SRAM "New" 2013 10-speed Red, Red 22, Force 22 and Rival 22 (non-hydraulic) hood covers. LOT of 2 Sets of SRAM 22 Brake Hood Covers. Good Luck and CRANK ON! 2 Pairs of Hood Covers. Color: Yellow. The other has about half life and there is 3 small cuts in the sidewall but there not broke through. All tires are very plyable and usable in that reguard the labels are all very nice. Bike parts lots! Aximo bike rack Cateye mini wireless Time rxs pedals Diety pedals (new) Carbon fiber bag Tubless tackle kit (new) Salsa bottle cage x2 Leyzn high pressure pump Abus folding lock Shimno shift cables x2 (new) K edge holder Wolftooth b-rad 3 Woldtooth double bottle. Material: Kraton. Length: 85mm. WE NEVER KNOWINGLY SEND OUT AN ITEM WITH PROBLEMS. OUR ORDERS ARE PROCESSED ON-LINE. CAN I SEE AN ORIGINAL PHOTOGRAPH OF THE ITEM?. A SIGNATURE IS REQUIRED, IF NO ONE IS AVAILABLE A CARD WILL BE LEFT AND THE ITEM CAN BE COLLECTED LATER. Specifications: Description: The steel balls are ideal for rebuilding your bicycle's bottom bracket. Come with 50 Pcs in one bag which is enough replacement parts for your bike use.